Extract and Convert Microsoft Outlook Email: How to Add an Email to a PDF Document? How to Add an Email to a PDF Document? 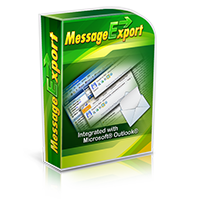 Previously, we discussed how to use MessageExport to add email messages to an existing pdf file. Today we would like talk about accomplishing this same task with PstViewer Pro, a sister product to MessageExport. While MessageExport is an add-in that works with Outlook, PstViewer Pro works outside of Outlook. In fact, it doesn't require the presence of Outlook to open .pst or .ost files. Formatting email messages into PDF documents present some unique challenges that are not present while converting regular documents to PDF. With email, it's important to include the header information (sender, receipient, subject, date) to give the message context. It's also necessary to consider how the file attachments must be processed. For example, should the attachments be extracted from the email and saved to a folder? Should they be converted into the PDF document? Or is it better to embed them within the PDF so that the file can be extracted later. Like MessageExport, PstViewer Pro includes a function to an email message to the end of an existing PDF file. First, select the e-mails from PstViewer Pro's email list. Selected e-mail appears in a blue highlight. Second, go to the Export tab and click "Add to PDF File." Either type the name of a new PDF file, or select an existing PDF file. That's it! The e-mail is converted and it's image will be appended to the bottom of the PDF file that you selected. 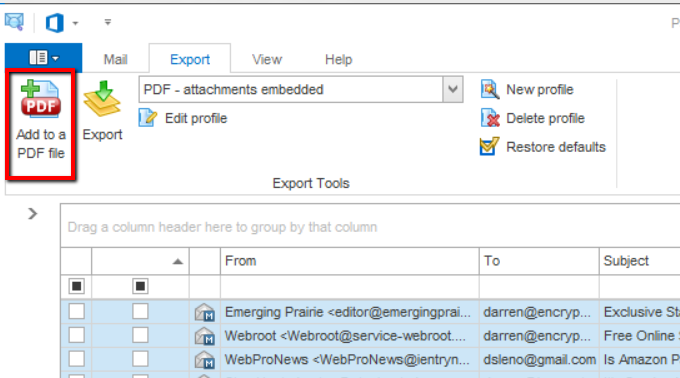 This feature allows you to add e-mails to a single PDF file as you discover them. PstViewer Pro also has the capability to export multiple e-mails to multiple or individual PDF files, in a single batch export operation. Download a free trial and follow along with the video. The trial lasts for 15 days. The cost of a single PstViewer Pro license is $69.99. Be sure when you please your order that you acquire the original PstViewer Pro by Encryptomatic LLC. Beware of brand hijackers who are trying to benefit from the good name of Encryptomatic's PstViewer Pro software. If you have any questions, post them below or email supportline at encryptomatic.com, and we'll be glad to get back to you.